The business of the Docklands Chamber of Commerce is largely undertaken by an Executive Committee.? Members of the DCC Executive Committee are elected from representatives of member businesses and they volunteer countless hours to ensure that the Chamber is an effective, responsive and ever-developing representative and advocacy body for business in Docklands. Joh Maxwell is the owner and operator (with her husband, Alan Maxwell) of two small businesses in Docklands ? Tours on Trikes and Trikeman Billboards. ?As strong believers in participating in the business life of your community, Johanna and Alan joined the Chamber soon after opening their business in Docklands & Joh came on board Executive Committee in 2010. ?Joh is a very active participant in the business community in Docklands both in her role as DCC Executive Committee member and as a small business owner. ?Being a resident; a tourism operator & small business owner in Docklands all give her reason to see the precinct prosper. ?Joh is now in her second year in the role of President and is looking forward to the next year of engaging with business and the precinct. Melissa joined the Bendigo Bank in 2013 after a 10 year sabbatical in the UK travelling, managing pubs and generally enjoying life.? After being appointed as the Bendigo Bank Branch Manager – Docklands in November 2015 Melissa started attending DCC events and joined as an Executive Committee member in June 2016. Since May 2016 Melissa has divided her time also managing the South Melbourne Branch in addition to the Docklands Branch. 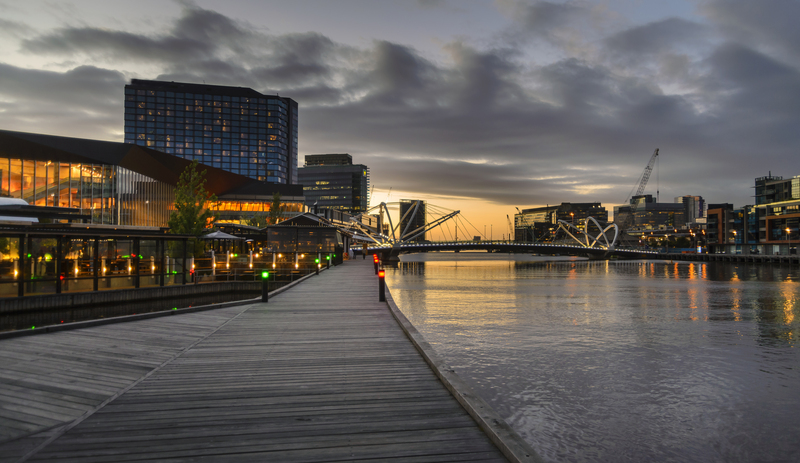 Melissa enjoys spending time in Docklands and sampling the variety and quality of venues available. Cameron Baker is the General Manager of Sebel Melbourne Docklands & Sebel Residences, a 200 apartment 4 ½ star property in Docklands which was named 2018 TAA Victorian Apartment of the year award winner. Having worked within Docklands now for over two years at the Sebel Docklands, Cameron has a great network of business operators, owners corporation and residences to engage with and work alongside to drive the brand of the Docklands precinct. Lisa joined the team at The District Docklands in May 2018, with over 18 years in retail and property management experience. Lisa has worked for landlords such as Centro Properties, Federation Centres and Vicinity Centre and retailers including Billabong and Marks and Spencer. Lisa has held regional and national marketing roles across centre, retail and leasing campaigns to development marketing including the launch of 3 prominent Melbourne centres which includes the Stage 40 development at Chadstone Shopping Centre. With a strong focus on branding, communications and customer experience, Lisa has a strong track record in building and leading marketing teams to deliver innovative and on-brand marketing programs and events with solid ROI as a key driver. Mo Hamdouna is the founding director of Mo Works, a Docklands based creative agency with hands wrapped around the world. Mo Works creates innovative visual communication and digital assets to empower businesses to be future ready. Mo is looking to represent the businesses of Docklands and support its activation through creative, user-centred ideas. Nicole Hill is Head of Sales & Marketing at Melbourne Star Observation Wheel. Nicole comes with over 20 years of international and domestic tourism, events and hotel management. Nicole spent 10 years in Las Vegas as an event planner before she returned to Australia 14 years ago. Most recently Nicole has headed up sales and marketing teams for major tourism attractions to working with some of the world’s biggest hotel brands. Nicole is a true believer in developing partnerships within a region to grow business for all to enjoy. Nicole looks forward to developing more partnerships and to continue to grow Docklands. Justin Jones is the Director of Sales and Marketing for The Sebel & The Sebel Residences Melbourne Docklands. As a sales and marketing professional with over 10 years of experience in the hotel industry, Justin works very closely with many of the varied industry professionals to build long term relationships and strategic partnerships. As a new entrant into the Docklands precinct and community in July 2017, Justin aims to work with all members on understanding how to leverage tourism opportunities in conjunction with hotels and events within the area. As a strong believer in growth and advocacy for the Docklands, Justin is looking forward to engaging and pursuing new opportunities for current and prospective members in 2018 and beyond.